Truffle is a mycorrhizal fungus which grow in a symbiotic relationship with suitable host trees, commonly English oak, Holm oak and Hazelnut. The tree roots are infected with the truffle mycorrhiza and planted out in prepared soil with a pH of 7.5 to 8. Truffles occur naturally in the limestone forests of Europe (mainly Spain, France, Italy,) but in recent years have been cultivated on soils modified by the introduction of lime and are grown in many countries of both the northern and southern hemispheres. Truffles are growing in every State and Territory of Australia except the Northern Territory. The truffles fruit each year and grow underground in increasing numbers, as the tree grows and the roots spread, taking the mycorrhiza with it. 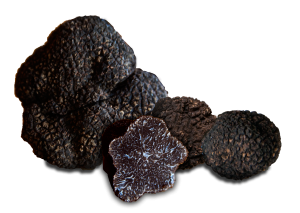 The truffles fruit in late spring, grow during the summer and autumn and mature with the onset of winter. They are harvested in winter using trained dogs. Harvest can be from from late May to August, depending on the season and location, but usually starts about mid June . The remains of truffle have been found in stone age middens, yet they still retain a great air of mystery. The Greeks thought they were caused by lightning and thunder and regarded them as seedlings of the Gods, warts of the earth, the spawn of sorcerers and witches. Aristotle declared them an aphrodisiac and Pythagoras agreed. The Romans were also fascinated and Apicius is on record as providing the first practical truffle recipes in Rome during the 4th century AD. Pliny the Elder, who documented the destruction of Pompeii, wrote about them! The church of the middle ages was outraged by the attention given to truffles and sermons were preached against them from the pulpit. They were black, had no visible link to the tree, harvested when all else was dormant & hibernating in the dead of winter, yet had an irresistible aroma and were considered an aphrodisiac. Definitely the stuff of sorcerers! The truffle returned to favour in the houses of the rich during the Renaissance and the church wrote about them in the 15th century in a volume called ‘Of Permissible Pleasures’. Napoleon ate truffle for strength in battle (and in bed with his fiery Josephine) and Rasputin recommended truffles to the Tsar for his blood and to improve the Imperial bloodline. Later in the 19 Century, Alexander Dumas said “to tell the story of the truffle is to tell the history of world civilisation” and French writer Brillat-Savarin said ‘”The truffle is not a positive Aphrodisiac, but it may under certain circumstances, render women more affectionate and men more amiable”. The Italian composer Rossini loved truffles and gave his name to the famous truffle dish, Tournedos Rossini. He also admitted “I have wept three times in my life; when my first opera failed, the first time I heard Paganini play the violin, and when a truffled turkey fell overboard at a boating picnic.” The Black truffle has also been referred to as the Mozart of truffles and the diamond of the kitchen! Truffles are a glutamate so they are a flavour enhancer, hence the affinity with any food. Every aspect of the meal becomes more satisfying, including the dessert. Like many exotic flavours, it can be an acquired taste, ‘Umami’, generally nutty, but then taste is 90% aroma. The aroma defies explanation, but can you describe the aroma of other exotic spices? Sniff the spice cupboard? A crushed, unpeeled garlic clove? Old Socks? Saddles? Molasses? Damp leaves and the earth? Sweet compost? Forest floor? Floral – Musty and Sweet? As a suggestion in serving truffles, a minimum for an entree plate would be about 3 gm and about 5 gm for a main plate. As an estimate of weight, a 50 gram truffle is about the size of a large hen egg. Truffles go with any food as they are a flavour enhancer (contain glutamic acid!) and have the ‘umami’, or savoury taste, but are best served with simple dishes involving eggs, mushrooms, chicken, pasta, potatoes, risotto, jerusalem artichokes, celeriac etc. Truffles have a great affinity for fats, any fats, which take up retain the exotic aroma. We have yet to develop a ‘Truffle Culture’, so new customers are best entertained by the full experience of seeing fresh truffle and smelling fresh truffle shaved on the food. Subtleties of more complex flavours from cooking with truffle will come later! Shave truffles as thinly as possible, as the greater the surface area exposed, the greater the aroma from the truffle serving. Truffle shavers or chocolate shavers (must be sharp) show the texture and marbling of slices. Microplanes are useful for some dishes, particularly where the truffle is to blended with fats such as cream or oils in sauces. Truffles are best stored in the refrigerator in a large jar, each wrapped in a paper towel to prevent them sweating, as they lose moisture (weight) and aroma continually and are best used within 3 weeks of harvest, but will keep longer. If they grow a little white mould, brush it off under running cold water and dry the truffle before replacing it in the fridge. Store the truffles with fresh eggs (any eggs!) in the same jar and within 24 hours the yolks will be infused with the truffle aroma ready for use coddled, in omelettes, scrambled, for making sauces and dishes that can be lightly cooked. You can also store them with raw macadamia nuts and the nuts will take up the aroma; delicious. Truffles can be preserved in alcohol and make an delightful and interesting addition to vodka, gin and other spirits. Remember fresh truffles are seasonal (June – August) and all commercial truffle oil is synthetic. If you need a synthetic truffle fix out of season, use the truffle oil sparingly. The aroma has been isolated by chemists and synthesised, fooling everyone as ‘Truffle Aroma’, but tastes nothing like fresh truffle.